Last week, an alt-right blogger who goes by the name Ayla had a bone to pick. Her comment came in a post titled “Mormon 'Rap' and the Destruction of White, Western, Mormon Culture.” It was jarring; Mormons are known for their moderate positions on issues like immigration and diversity, famously putting them at odds with now-President Trump. Extreme movements such as the alt-right — which catapulted into the public consciousness on a wave of support for Trump, Pepe memes, and white nationalism — are anathema to many members of The Church of Jesus Christ of Latter-day Saints (LDS). And while Mormons have rejected Trump's brand of conservatism, thanks in large part to the president's more controversial positions, Ayla's comments represent a growing Mormon subculture that embraces the alt-right, at times openly cheering white nationalism, and intertwining ultra-conservative ideology with Mormon history, culture, and scripture. Ayla did not respond to BuzzFeed News requests for comment for this story. The alt-right's preoccupation with race pervades the Mormon wing of the movement. Ayla isn't alone in her appreciation of David Duke's racist remarks. Members of the Mormon alt-right have Twitter timelines peppered with tweets about “white genocide,” nationalism, and white supremacist slogans such as #14words. Others frequently cite the religion's namesake text, The Book of Mormon, as evidence that races shouldn't mix. Some merge important figures and images in Mormon theology with symbols of white nationalism. 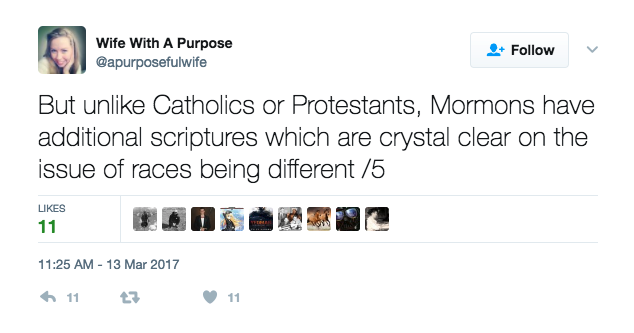 And sprinkled in are retweets from the LDS church's official account. Members of this community aren't joining the alt-right in spite of their Mormonism, they're doing so because of their Mormonism. The rise of a Mormon alt-right has been met with dismay by more centrist members of the religion, some of whom say Mormonism still has lingering problems with racism. Part of the issue comes down to interpretation. The Book of Mormon does include passages that describe an ancient people being “cursed” with dark skin. And the church infamously barred men of African descent from its lay priesthood between the late 1800s and 1978. In many cases, members of the Mormon alt-right have seized on these racially-fraught parts of Mormon history as evidence in support of their cause. The Book of Mormon tells a story about a people who were destroyed by their “ethno-nationalism,” said Robert Taber, a Mormon and history professor at the historically black Fayetteville State University. Still, Taber said Mormonism has “elements of a pretty racist tradition” as well as “elements of a pretty anti-racist tradition.” Asked about the racially charged comments made by Mormons in the alt-right, Richardson said he's seen “quite a bit of it” in the church's home state of Utah. Crystal Young-Otterstrom, a national co-chair of LDS Democrats, was “shocked” when she recently read one of Ayla's blog posts circulating on the web. Racism has “no place in Mormonism,” she said, and the church needs to do more to clarify and disavow racist elements of its past. But not every Mormon sees the alt-right as fundamentally racist, or necessarily wrong. Clark said Mormonism is “not compatible with the 'Hitler Did Nothing Wrong' contingent of the alt-right.” But when people like Ayla “cite The Book of Mormon or the Bible to support nationalist ideas, they aren't wrong,” he said. Clark added that in his view the biggest gulf between Mormonism and the alt-right was merely one of style. The Church of Jesus Christ of Latter-day Saints has condemned racism, but it's not entirely clear where it stands on nationalist comments made by its members. The church declined to comment on individual members' online activity. Spokesman Eric Hawkins instead pointed BuzzFeed News to a series of essays the church has published condemning racism, taking a moderate stance on immigration, and embracing political neutrality, among other things. “We believe we are all children of God,” Hawkins said in an email. The church did not answer questions about whether white nationalism is compatible with the faith, or what kind of vetting process is used for member profiles on Mormon.org — where at least one alt-righter has created a profile. It's consequently unclear if actions by members on the far right could result in the kind of discipline that several left-leaning members have faced in recent years for challenging church policies. For now, the Mormon alt-right looks like its here to stay, along with the larger movement that continues to influence American politics via media outlets like Breitbart. Ayla's most-watched video — published in September 2015 and praised on a white nationalist forum — has been viewed more than 100,000 times. In it, Ayla blasts the “Muslim invasion of Europe” and blames feminism for the refugee crisis. “It's gone to heck,” Ayla says in perhaps the most Mormon comment ever uttered from within the alt-right. LINK: What Kind Of Mormon Are You, Really?